I love lip tints! They come in so many colours and textures, and you can create the super trendy and extremely pretty Korean ulzzang gradient lip look with them. This is my first product from Peripera. What do I think of it? Read on to find out! I picked up this colour in my February 2014 Testerkorea haul (you can read more about it here). I think this colour was previously released as a Gmarket exclusive and I couldn't find it on ebay, BeautyNetKorea, or Rose Rose Shop during early 2013. It was constantly sold out on ebay. I also only saw two blog swatches of it, but it looked amazing so I knew I had to have it! What They Say: Like juice, this water tint spreads upon lips with vivid colors. With a single touch perfectly dewy colors give an elegant look. Fruit Complex help give vitality to the lips. Contents: 6.5ml. Tint is housed in a glass nail polish esque bottle (yes, like Benefit tints). Application: Comes with a short doe foot applicator. Swatch. Colour is pretty close to what it really looks like. Whilst colour itself is a shockingly neon pink in the bottle, it looks surprisingly natural when you blend it out on your lips. The texture is a water tint, so you have to be careful not to apply too much at once or it will drip everywhere! You should wait for the first layer to dry before applying additional layers, but I feel the more layers you apply, the worse it looks. On me, it wears off after an hour or so. As the colour is such a light neon pink, it does tend to struggle to show up on more pigmented lips. I'd say when I wear it, it looks more pinky-red on my lips without lip concealer. It also mixes in strangely with my Innisfree lip concealer to create dark and gross looking patches, but can work with BB creams as a base on your lips (strange). Unfortunately, the quality of this product disintegrates very quickly. After a few weeks of use, Mari Kim's drawing is already flaking off, the applicator has shedded inside the bottle, and I think the formula has separated and become very gritty. Sad, I know. It smells like a very lovely fruity candy when you open up the bottle! The bottle is shaped like a nail polish, and the wand it very short. This can get annoying as the cap may brush against your lips and smudge your hard work. I rarely wear this colour by itself. It works best as a light wash over lips before applying a darker tint on top. I know that there are a million and one gradient lip tutorials out there, but I think I may put one together using different shades (pink, red, coral, orange, lavender) and feature this in it. This is my least favourite lip tint in my entire collection... and that's saying a lot. If you are after a nice baby pink, I would recommend you to try Etude House's Fresh Cherry Tint in PK001 (pink) instead. 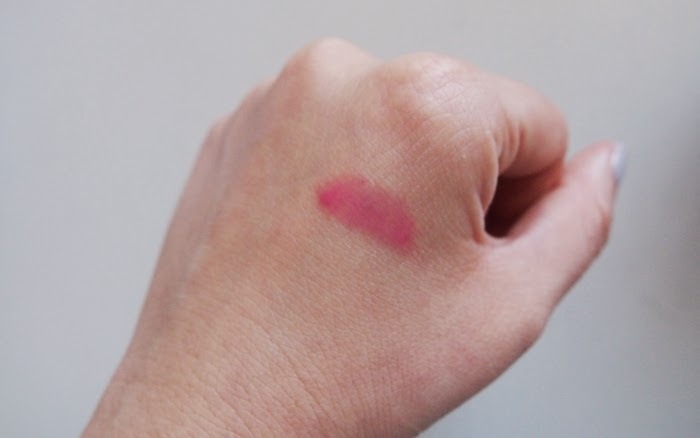 I can't say all the pros and cons of this product extend to other colours, but I sure am not rushing out the door to buy anymore lip tints from Peripera again. I wouldn't repurchase this. Might be a nice watery colour to try if you have extremely pale lips; it doesn't play nice with lip concealer. Otherwise, I wouldn't recommend it. Yeah, it's a shame as the packaging and the colour is beautiful~ just too watery for me to enjoy working with it. Your profile pic looks so pretty! Ps : I love your reviews!